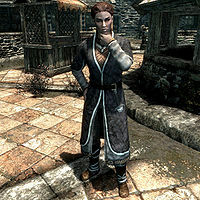 Drifa is a Nord pawnbroker living in Riften. She owns the Pawned Prawn with her husband Bersi Honey-Hand, and will take over the business if anything happens to him. She cares deeply for him but thinks that he spends too much time worrying about crime and corruption in Riften and not enough about himself. He believes that someone is trying to make a move to take the Pawned Prawn from them, but she thinks he is just being paranoid. Drifa wears a set of fine clothes and a pair of fine boots. She is equipped with a leveled dagger which can be up to elven quality, and carries a key to her store, as well as a selection of common loot and gold. Drifa greets visitors to the Pawned Prawn with: "Hello. Welcome to the Pawned Prawn." and "If there's anything you need, I'd be glad to help you." She can often be heard speaking of her husband, saying things such as: "My husband Bersi will be the death of me. He spends too much time worrying about Riften and not enough about himself. ", "All the crime and corruption in Riften is really getting to him... and now that we hear rumors about the dragons, he's been very depressed. ", "Bersi's afraid that someone's making a move to take the Pawned Prawn from us. I think he's being paranoid. ", "We both own the Pawned Prawn together, but he's singlehandedly kept the place running despite all our problems. ", or "I just care about my husband so much and I hate to see him in this state." She will say goodbye with "Be careful out there... Riften can be dangerous." She may be accosted by either Snilf or Edda, Riften's two beggars. Either way, she will take pity on them, telling Snilf, "Very well, please use it for food." and Edda, "Oh, very well. Just try and clean yourself up." During the quest Spread the Love, you have the option to give her a missive, which she will accept gratefully with: "Oh, how kind! Thank you." During the quest Taking Care of Business, you have the option of persuading Bersi Honey-Hand to repay his debt with the Thieves Guild by breaking his prized Dwarven urn. While you are breaking it and Bersi is lamenting his ill fortune, Drifa will loudly tell her husband to "Just pay them, Bersi!" Bersi Honey-Hand: "Drifa? I was looking through our books and there's an entry for 'spices.' Says we spent 300 septims. What is that?" Drifa: "Spices? I'm certain I have no idea what you're talking about." Bersi Honey-Hand: "You sure? It was in your handwriting. If you can't keep the books straight then let me do them." Drifa: "Oh, yes... spices. That was a special order for someone in Whiterun. Should be along any day now. Don't let it worry you, my dear." Drifa: "We got a few pieces of jewelry at the Prawn, Madesi. Want to come take a look at them later?" Madesi: "I wish I could, milady. Sadly, I haven't sold enough of my own jewelry let alone buy some from you. I'm sorry." Drifa: "Oh, I'm so sorry. I'm certain Bolli [sic] would be happy to lend you a few septims." Madesi: "Much appreciated, Lady Drifa, but I'll manage." Drifa: "Mjoll! I'm glad I found you." Mjoll: "What is it, Drifa? What's the matter?" Drifa: "It's Bersi. He's getting so angry about the corruption in Riften, he said he's going to walk right up to Maven and give her a piece of his mind." Mjoll: "If I see him, I'll make sure he doesn't do anything brash. Don't worry." This issue has been addressed by version 2.0.1 of the Unofficial Skyrim Patch; the audio and dialogue text correctly refer to Nivenor instead. A letter addressed to Drifa from Talen-Jei asking about an Argonian wedding ceremony in the temple of Mara appears next to Dinya Balu's bed in the temple. However, Drifa has no connection with the temple. Given where the letter is found, it's likely Dinya Balu was meant to be the recipient instead. This issue has been addressed by version 2.0.7 of the Unofficial Skyrim Patch; the letter is addressed to Dinya instead. Drifa doesn't sleep as she was intended to. Drifa isn't marked as essential prior to A Chance Arrangement, and if she is killed before completing the quest then the succeeding quest, Taking Care of Business, will not start. During the quest Caught Red Handed Bolli will remark he never slept with any woman other than his wife Drifa; however, Bolli is actually married to Nivenor.